Growing up I was always involved in a wide variety of extracurricular sports, so the transition to college while also not being an athlete for the first time in my life was definitely a strange one. I tried to supplement this in a variety of different ways. Freshman year was full of trying a variety of intramural sports every season. Sophomore year I began to play tennis regularly with one of my friends and that spring I trained for my first marathon. It was exciting to have a goal to work towards, but there was still something missing. I wasn’t excited or passionate about sports the way I was doing crew in high school or playing middle school basketball. Then, this past winter session, something changed. I got a gift card to a local rock climbing gym. Rock climbing was always something that fascinated me. For one, it was pretty much a giant jungle gym made for adults, while also being an insanely good workout. Beyond that, I had many fond memories of rock climbing at the local YMCA when I was kid. I also loved being outdoors and the idea that gym climbing could prepare me for new outdoor adventures was a major draw. Although I was incredibly hesitant to set foot into the gym for the first time, from the moment I did I was hooked. When my two week trial expired, I got a membership and began going 3-4 times per week. All I talked about was rock climbing, I dragged friends and family to the gym with me, and my Instagram feed became full of bouldering, top roping photos, and hashtags. I had finally found a new sport that I was passionate about and excited to continue. When it was time to head back to UD, I was nervous that my new dedication would not translate when I was back in the hustle and bustle of all things junior year. However, UD has allowed me to continue to pursue this new sport and challenge myself mentally and physically. The rock gym in the Lil’ Bob has a variety of different routes and is open six nights a week. 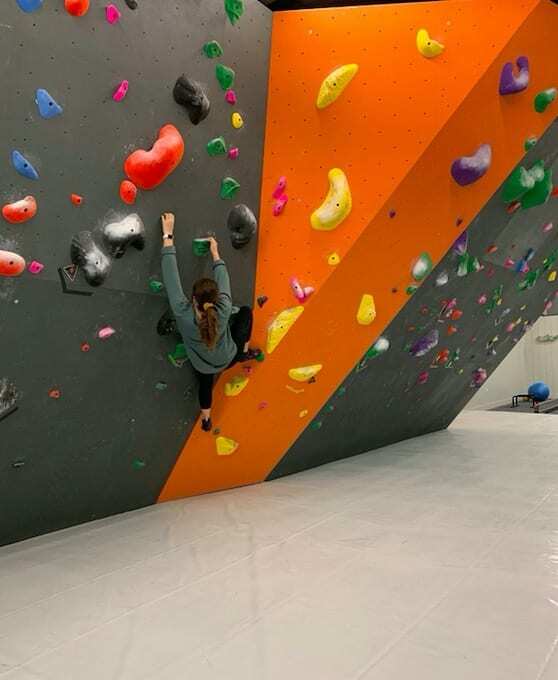 Beyond the confines of the UD campus, less than 10 miles away is the DE Rock Gym, which offers a ton more routes and expands to lead climbing and top roping. I have not only found a new sport and way to stay in shape with rock climbing, but it has also offered me a new community and a way to stay grounded mentally. Going to the rock gym has become something that allows me to take a mental break while challenging myself to climb to new heights (literally). The community is so open and encouraging. I’ve often found myself engaged in conversations with fellow climbers of all different abilities, all of us trying to help each other to accomplish our goals in a non-judgemental environment.